North Walsham Lingate mill was a 5 storey tarred red brick towermill, often known as New Mill. 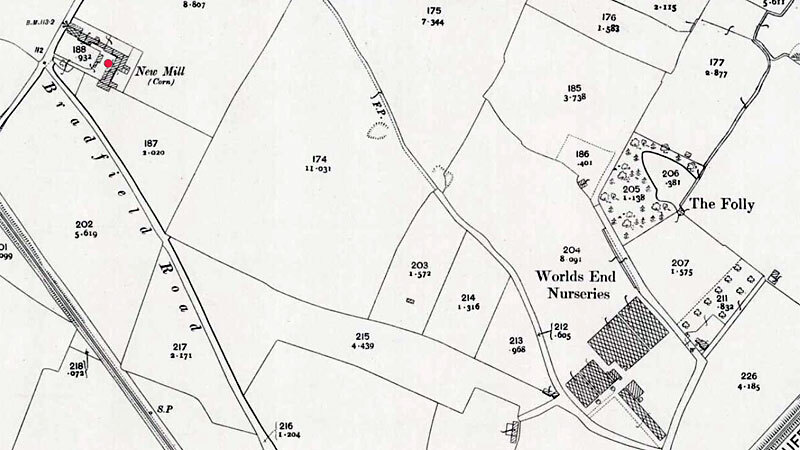 It was sited in a farmyard on the Bradfield Road, along with some low tiled barns and a large brick store on the northwest side of the town close to the railway line. The mill used patent sails to drive 2 pairs of stones. A steam mill driving a further 2 pairs of stones was also operated on the mill site. 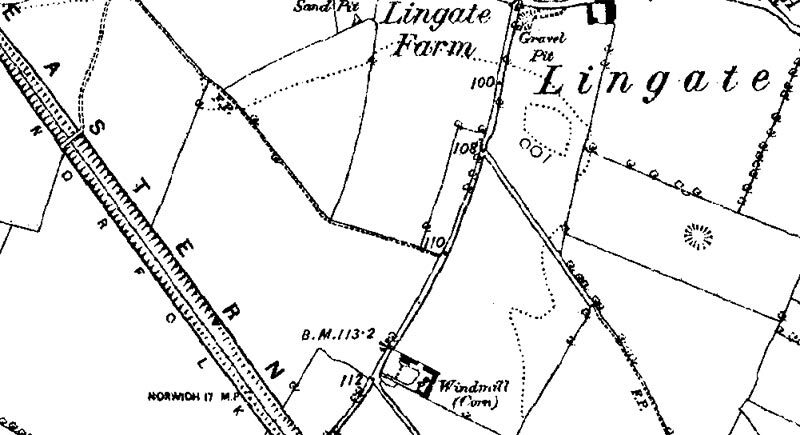 A TOWER WINDMILL with half an Acre of Freehold Land. Five floors, two pairs of Stones, patent Sails and going Gear complete. 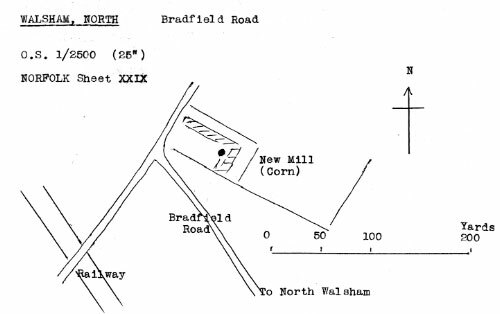 At NORTH WALSHAM ... A Tower Mill in the parish belonging to Mr. W. Cooper sustained considerable injury, the cap being broken, the sails blown away etc. 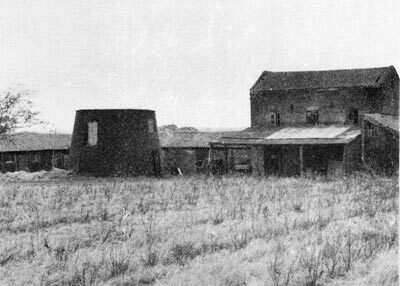 WILLIAM POPE is instructed by Mr. William Cooper to Sell by Auction this month, his newly erected WINDMILL and STEAM MILL with a good trade attached, unless sooner disposed of by Private Contract, with possession at Michaelmas next. For price and particulars apply to Mr. Cooper or the Auctioneer, both of North Walsham. William Pope on Thursday next September 4, 1862 at the Feathers Inn in North Walsham in one Lot at 6 o'c in the Evening. A Freehold Brick Tower WIND-MILL driving two pairs of Stones. Also a capital STEAM MILL driving two pairs of Stones, with all the Machinery complete and now in full trade, in the occupation of the Proprietor, Mr. W. Cooper, with Possession at Michaelmas next. For Particulars and Conditions of Sale apply to Mr. Fred Fox, Solicitor, Norwich or to the Auctioneer, North Walsham. ... A Mill at North Walsham lately put into repair belonging to Mr. William Cooper sustained injury in the loss of her fliers. As Mr. Robert Lee, foreman to Mr. William Cooper, Miller, of North Walsham was adjusting the millstones, the mill drew on from the violence of the wind and the machinery caught his left hand cutting off two fingers above the first joint. WANTED, a Married Man to work a TOWER WINDMILL. House provided. Apply to William Cooper, New Mills, North Walsham. Great damage was occasioned on Sunday evening last (19th) between seven and eight o'c by a terrific gale, to a tower windmill belonging to Mr. William Cooper, miller. The mill was completely stripped of her sails and cap which in their fall did great injury tot he counting house and building adjoining. Fortunately no one was in or near the mill at the time. Only half an hour before some persons ascended to adjust something connected with the fly wheel, which was out of repair and to do the best for safety. The damage is considered to amount to £150 or upwards. A SET of PATENT SAILS 7 ft. 9 in. wide, nearly new. Apply to W. Cooper, New Mills, North Walsham. Household Furniture etc. effects of Charles Greenacre, October 2.
the NEW MILLS, North Walsham. Apply to W. Cooper, Brewery, Aylsham. To be Sold by Private Contract, with Immediate Possession if required. WIND & STEAM MILLS with good House & Premises. Apply to William Cooper, Brewer, Aylsham. The whole cap of Mr. W. Bircham's mill was blown off. Mordecai Bircham of North Walsham, miller, pleaded guilty to not having his name painted on his cart as required by statute. The defendant said he was sorry the offence had been committed and although his name was not affixed to the cart as required, he had a canvas bag hanging from the cart bearing his name as a substitute. The Bench convicted and imposed a fine of 1s. 6d. and costs of 3s. 6d.